We have seven characters who show up in “The Enduring Chill.” Not one is portrayed favorably. 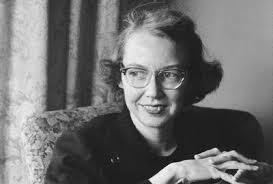 Most are nearly cartoonish in that special Flannery O’Connor way that is hilarious, mean, angry, and oddly sympathetic. The story ends with real and intense meaning. Something must have connected amidst all the punchlines and character attacks. So, what happened? Where was the meaning? Which character was earnest? I’d argue it’s the priest. The humor in his character doesn’t derive from who he is as much as it is who he is in relation to what Asbury expected him to be. The things he says – taking a traditional Catholic hard line with Asbury – feels like the story’s fundamental, genuine belief. It is the foundation of normalcy by which all the other characters become cartoons in their oddball ignorance. So that’s what I think. Yep. That’s why the story works. She pulled the car into the side drive and a scattering of guineas exploded into the air and sailed screaming around the house. “Home again, home again jiggify jig!” she said. “The artist arrives at the gas chamber,” Mary George said in her nasal voice.